Power：380v/3p 50/60Hz 6Kw AHR80R is special for container doing hot-stamping, which is good at doing hot-stamping for soft tube or jars Etc. AHR80B using indexing and mechanical rotating transportation system, tooling on the machine rotating one cycle to finish hot-stamping. 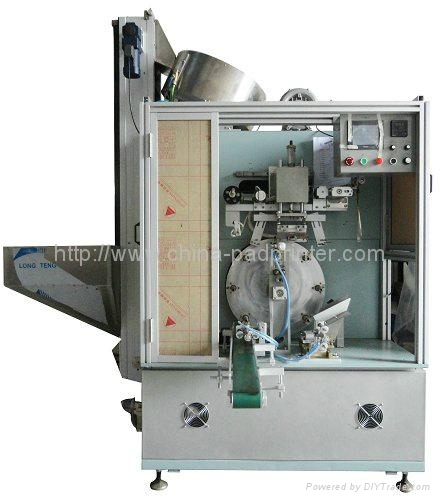 The machine is with precision design and auto-registration system, Max. speed can reach 3600pcs/hour. Stamping foil is controlled by synchronous motor, which can save foil by Max. speed can reach 3600pcs/hour. Stamping foil is controlled by synchronous motor, which can save foil by setting stamping size. The perfect design can match printing requirement of many types of container. It equipped with PLC, touch screen , “No-Pcs No-Printing”, servo rotating sensor registration, synchronous front-back sensor registration, conveyor loading and unloading system, anti-static(option). Furthermore, AHR80B can do hot-stamping for wine cap, the servo-printing system can be changed into mechanical printing system to save printing cost.